Back to Hanoi in the afternoon, as we walk through the old quarter, we could see more clearly how vibrant the city was. At dusk, people sat on small chairs holding white bowls of noodle soup. They had their early dinner. In every junction, pedestrians had to compete with the motorcycles to cross the streets. 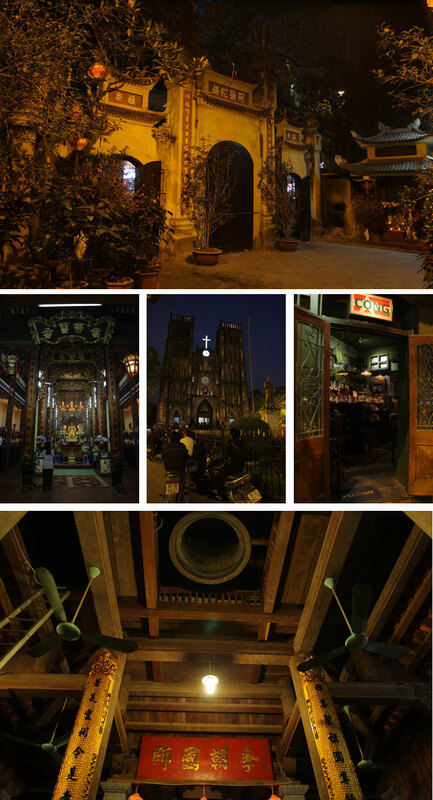 Soon after dark, we went out from the hotel, passing through Chùa Lý Triều Quốc Sư, a richly ornamented old temple built in the 12th century. This temple was from the same periode with the one demolished to give a space for St Joseph Cathedral. The interior was awesome, with a huge bell hung above the ceiling. It was Sunday night, and the cathedral was overcrowded. Hundreds of people came to attend the mass. Those who didn’t get seats inside would spend hours outside, sitting on their motorcycles to hear the sermon. That night, relying on google map, we headed to the old market of Cho Dong Xuan. It was said that there was a night market nearby. 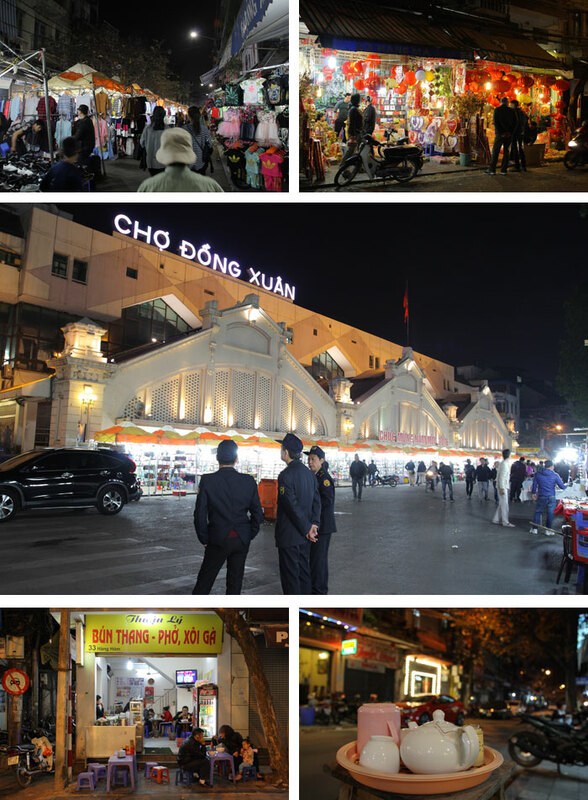 Turned out, it was just an ordinary night bazaar, not as vibrant as Ho Chi Mihn’s Ben Tahn Market. To end that cold night, we had dinner at a food stall selling chicken noodle soup. The following morning, we walked to the Mausoleum where the body of the great leader, Ho Chi Minh, was eternally laid down. We stopped by at a park just to watch a group of people practice their dancing moves. Well, the French might have long gone from Vietnam, but their dances stayed in this city. The mausoleum was closed on Monday, we couldn’t see the body. So just like the other tourists, we took a lot of photos outside. Be extra careful while walking around in the plaza right in front of the mausoleum as some certain areas are restricted for tourists. They’re not allowed to trespass the boundary watched by some guards in white uniform. 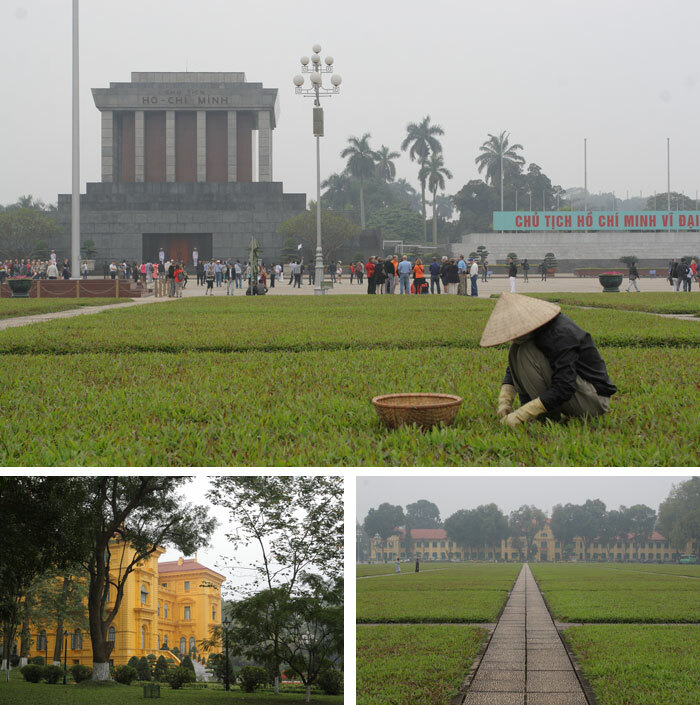 Situated in the former French colonial administration in Vietnam, the mausoleum is surrounded with old French colonial buildings like governor’s palace, residential and office. All are located in a beautiful garden with a small man made lake in the centre. This garden reminded me so much of the botanical garden in Bogor, West Java, where the Dutch built a palace for the governor general in it during their colonial years in Indonesia. When Ho Chi Minh ruled Vietnam, he occupied the facilities in this place. 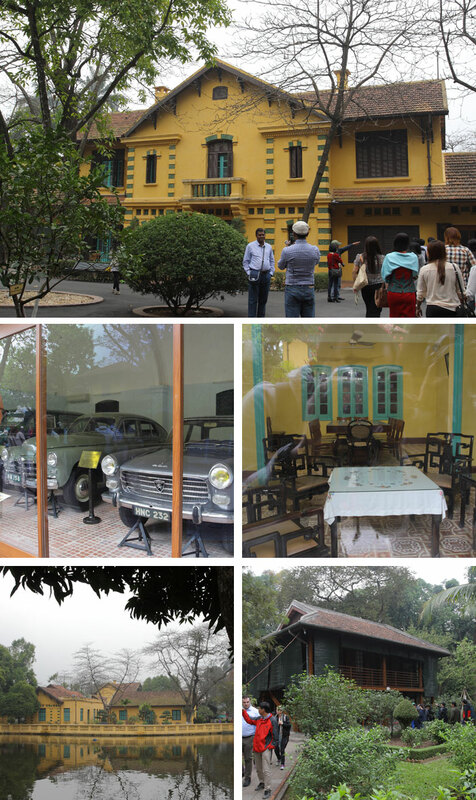 Instead of living in the former French governor’s palace, Uncle Ho decided to live in a modest stilt wooden house that is still preserved until today. We got the opportunity to see what the interior looked like through the glass as no one was allowed to enter the house. At the garage, we could see how that communist leader loved to ride European cars. There were three cars parked in there. Each came with its own history. What I liked about Hanoi was they preserved their royal and French colonial heritages quite well. Not far from the palace complex, there was still standing an ancient pagoda dated to the 11th century when Vietnam was ruled by Emperor Ly Thai Tong. The pagoda was erected on a massive pillar standing on the water. It’s like a lotus coming out from the pond I guessed. To see what’s inside the pagoda, we had to line up in such a long queue. There was also another temple nearby, but I had no idea its history. At that moment, to us, all the temples just looked the same. In the afternoon, we had to leave Hanoi for Hue. 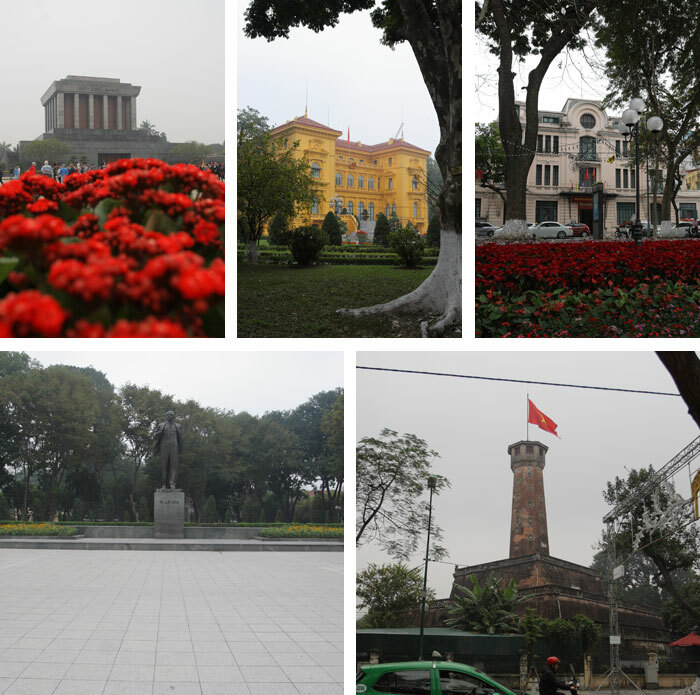 So before we checked out from the hotel, we walked around the old quarter of Hanoi yet again. It became more obvious to us that the old quarter was very vibrant with people only at certain time like, let say, weekend nights. When we strolled on the streets at noon, the quarter was just like an ordinary regular cramped old town. Before walking back to the hotel, we stopped by at Quan Chuong Gate. It’s like the only old gate that remains in Hanoi. 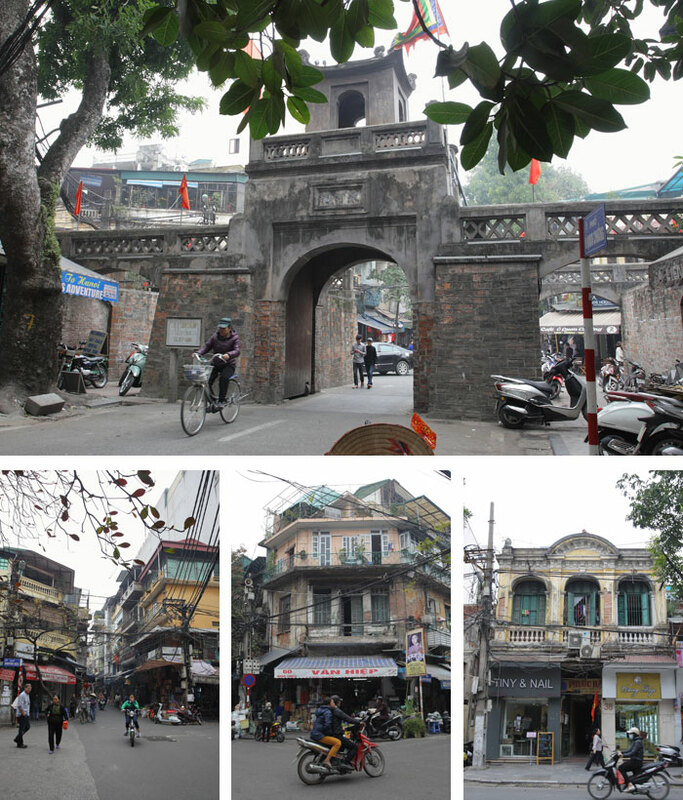 Just like many ancient cities, Hanoi used to be surrounded with thick walls with gates. The gates were open during the day and closed at night to control anyone coming in and out the city. In the 18th century, there were sixteen gates in total. By early 20th century, only five remained. Today, there’s only one gate survives, and that is the Quan Chuong Gate. It’s a gate with three arch shaped entrance with a floor on its top. It was said that the all the gates were under strict surveillance so as to make sure that the city was save and secured. Today, the gate was covered with moss and dust. For centuries, many people from many places had walked in and out through the gate. And I was happy to be one of them.